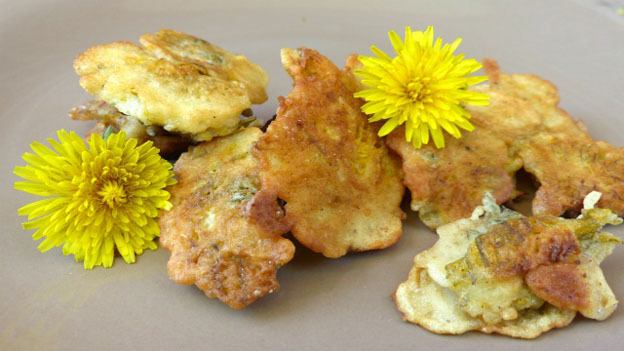 Enjoy the health benefits of dandelion flowers in a fritter batter with the spices you and your family love. Edible dandelion flowers are a fabulous way to add a touch of wild to your meal! Mix the milk, flour and eggs and beat until blended well. Warm some olive oil in a skillet on the stove (keep at medium heat). Holding the underneath of the flowers, dip into the batter until totally covered in the fritter batter then place into skillet, flower side down. Once they are brown, flip and brown the other side. If need be, continue flipping until the batter coating is light brown. Remove from oil and allow excess oil to soak onto a towel or paper towel. Eat plain or drizzle with maple syrup, honey, or even roll them in icing sugar while they are still warm. Be creative – add your favourite spices or herbs to the fritter batter!